Penny McDonald’s debut game, Answer The Question, released on Steam this week to unanimously positive reviews. Also, Penny is 7 years old. Her game, Answer The Question, supplies players with an infinite cascade of math questions, which they receive points for answering correctly. “I tried to make an action game, but I wasn’t ready, so I made a different game,” Penny told Kotaku (as relayed by her father in an email). After a few days of work, Penny completed the game and asked Lance if he could help her publish her game on Steam. “I thought that, if my family can have this game, why not other people?” said Penny. A few years ago, Steam’s submission process might not have allowed for this sort of thing, but these days, Steam is stocked wall-to-digital-wall with far more slapdash stuff than a starry-eyed kid’s first game. Lance explained that he has a toolchain in place for porting Windows 98 QBASIC games to more modern systems and adding modern features like Steam achievements, so prepping the game for its time in the spotlight was easy. “She also uses that computer to play The Sims a lot, so she’s comfortable with it,” Lance said. The father-daughter team briefly hit a stumbling block, however. After an initial submission, Steam rejected Answer The Question. This was not an indictment of the game’s quality or lack of open-world survival mechanics that require players to hoard freshly slain addition problems, but rather the game’s Steam page, which needed a better logo. As of now, Answer The Question is up on Steam and has ten positive reviews. Most of the reviewers do seem to be aware that the game was made by a 7 year-old, but hopefully, that positive encouragement will continue. Penny plans to make more games, with the eventual goal to climb her personal Everest: developing an action game. 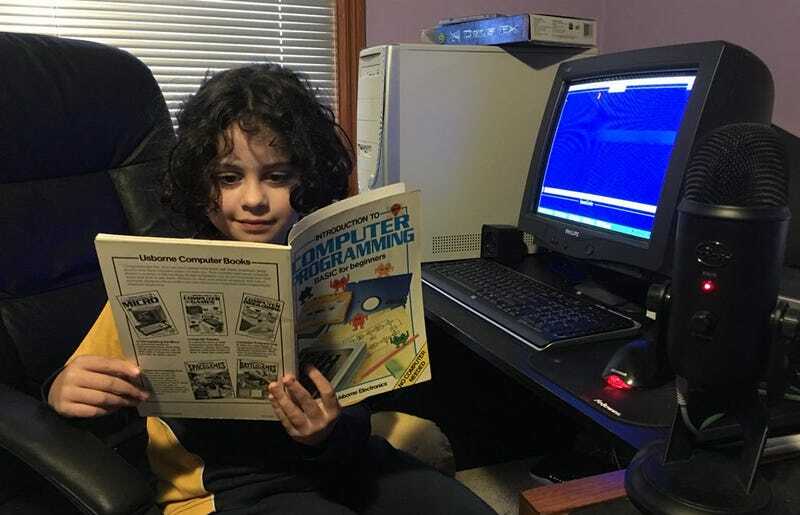 “Yes, I do want to make games, and until I learn how to make an action game, I am going to make a game where you can think about the game in your head while you type what you want to do,” she said.